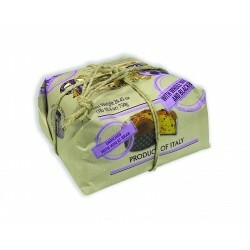 Panettone with Pistachio cream and covered with dark chocolate and pistachio grains hand-wrapped in elegant old type paper. 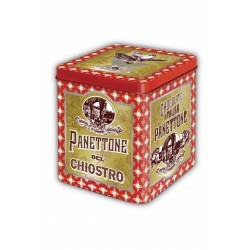 The Panettone Chiostro di Saronno is produced according to the traditional recipe and criteria, through a slow and natural leavening and all ingredients, from flour to milk, eggs to butter, candied fruit to yeast, are of natural origin strictly fresh and genuine, free of preservatives and colorant. wheat flour, pistachio cream 15% (sugar, glucose syrup, water, pistachio paste 8%, egg yolk, sunflower oil, skimmed milk powder, milk cream powder, natural flavours, stabilizer: pectin, preservative: potassium sorbate), eggs, sugar, butter, dark chocolate 5% (sugar, cocoa mass, cocoa butter, emulsifier: sunflower lecithin, natural vanilla flavour – cocoa: 51,5% min. ), egg yolk, milk, natural yeast (wheat), pistachios grains 1,3% and cocoa nibs 2% (powdered sugar, wheat starch, non-sunflower oil, cocoa 5%, cocoa paste, gelatin), pistachios paste, emulsifiers: mono and diglycerides of fatty acids, glucose syrup, natural flavours, cocoa butter, salt. May contain other nuts and soy.